My research concerns molecular evolution and physiology traits necessary for adaptation of organisms to extreme environments. Recently, I became interested in acclimatization mechanisms from organisms experiencing challenging environmental conditions, and also the necessary trade-off between genetic adaptation and phenotypic variability. Within a larger scope, I am also interested in science communication and proper ways to engage in outreach activities. Black-chinned hummingbird in the Colorado mountains (2011). In high altitude environments oxygen availability is a problem, and vertebrates with high metabolic rates must face physiological challenges to overcome this obstacle. For my postdoctoral studies I followed my line of research, but at the other end of the Earth spectrum, by studying adaptations to high-altitude hypoxia in Andean hummingbirds (among other vertebrates). Hummingbirds are fascinating animals due to their size, behaviour and colour patterns. But there is more than meet the eye, as these tiny birds have one of the highest basal metabolism among vertebrates. Most likely, molecular adaptations should be in place to meet metabolic needs in hypoxic environments (mountain habitat). Using several species of hummingbirds occupying a range of habitats (from sea level to almost 5000 m) in the Andes (South America), I was concentrated in characterising the different haemoglobin phenotypes (affinity to oxygen), and to discover if these could be linked to particular genetic signatures. Together with other lab members and collaborators, I made use of phylogenetic tools, functional properties experiments, protein recombinant experiments and 3D protein modelling. We were able to show that, in the case of Andean hummingbirds, there was parallel adaptation of haemoglobin function in multiple species but in different evolutionary directions, depending on high-altitude or low-altitude populations. This was possible through amino acid replacements in the same pivotal protein sites. Scale-worm (red, indicated by the yellow arrow), from the Polynoidae family, inside hydrothermal vent mussel. Extreme environments and the capacity to adapt to harsh conditions continued to interest me. A striking example of such conditions are the deep-sea ecosystems (hydrothermal vents, cold seeps), where organisms rely on bacterial capacity to transform toxic elements into usable energy. During my PhD I was fascinated by the respiratory adaptations that some polychaete scale worms (Polynoidae), inhabiting hydrothermal vents, might have developed in order to occupy a wide range of habitats: from the cold deep sea with plenty of oxygen, to almost the top of the vent chimney where temperatures would be high and few oxygen would be available. I concentrated my studies on the evolution of globins, that were highly expressed in these polychaete species (organisms would be pinkish or red). I made use of phylogenetic tools, positive selection analyses, globin functional properties experiments and 3D protein modelling to understand what was special about deep-sea polynoid globins. It turns out that these are very special and unique globins, being well suited to fulfil their respiratory function in organisms occupying hypoxic deep-sea environments. Mud crab from Poland ready for geometric morphometric measurements. Exotic species was one of my first research interests, mainly because of their capacity to occupy and thrive in new habitats. At this point I was maturating the idea of studying what makes invasive species unique, not only behaviourally, but mainly at the genetic and physiological level. For my master studies I engaged in the study of population genetics of an exotic species, Rhithropanopeus harrisii, in the European waters. 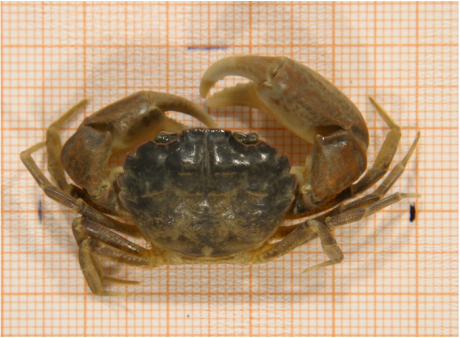 This crab is known to occupy estuarine environments with muddy conditions, like oyster cultures. My goal was to find out which North American population was the founder of the European settlements. I used mitochondrial markers (COI) and morphometric analyses to characterise populations and find their origins. I found out that the most likely area that contributed with colonists must have been from the north east coast of USA. These findings go along with historical evidence of oyster trade between New Jersey and Europe.